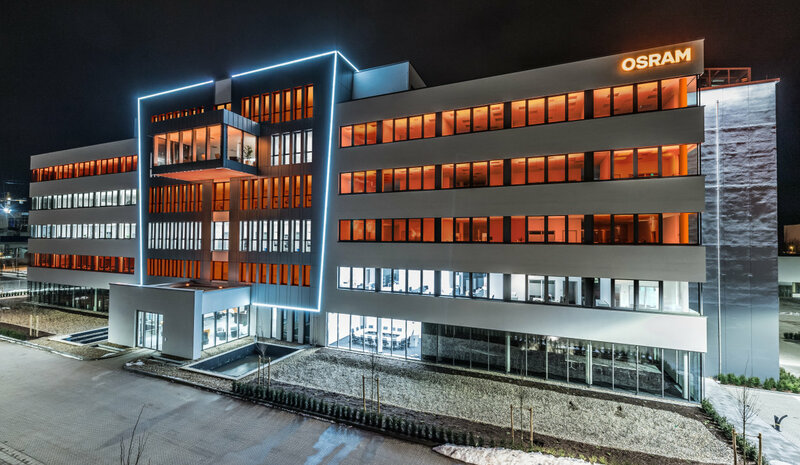 The main administrative building of Osram Opto Semiconductors at their Regensburg, Germany location is completely equipped with an LED-based HCL concept for the office and conference rooms. The lighting concept realised together with Osram Lighting Solutions features high vertical illuminance values in activating mode (250 to 500lx), dynamic white colour temperatures (Tunable White from 3,000 to 6,500K) as well as dynamic light control with the possibility of programming scenes and real-time programming. The core of the lighting system is the Osram light management system 'e:cue Sympholight' – a high-performance Smart Lighting software that enables both functional and dynamic (e.g. RGB) light systems to be controlled out of a single application. More than 1,000 HCL-capable luminaires were installed throughout the building. Approximately 3,000 luminaire control units, more than 350 sensors and several KNX push-buttons are networked to enable innovative light management applications such as occupancy detection, time-based control, control of daylight and swarm control within a single system. The aim of HCL concepts is to transfer the characteristic of natural lighting and its associated biological effect to people in interior spaces. A lighting situation is created that supports the biorhythm of people via the intelligent, dynamic control of artificial light at various brightness levels and colour temperatures. This achieves significant improvements in well-being and performance capability at the workplace, among other methods by improving concentration, reducing fatigue and promoting the process of regeneration. 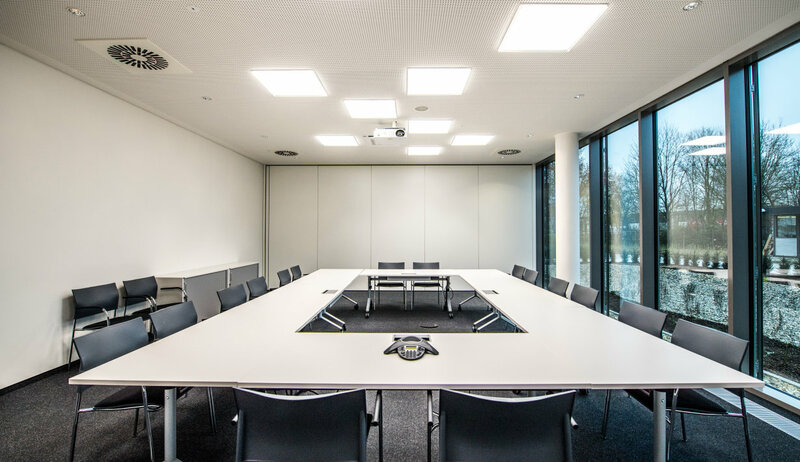 With the aim of utilising the positive biological impact of light, a natural daylight sequence is simulated in the building's open-office areas and conference zones with Mira Tunable White recessed luminaires from Siteco. Starting at 6 a.m. with 3,000 K and a horizontal illuminance of 500 lx, illuminance then approaches its maximum midday level of 6,500 K and approximately 800 lx in the horizontal (i.e. approx. 300 lx in the vertical). The dynamic daylight sequence then ends at 6 p.m. with 3,000 K and 500 lx. Seasonal factors of influence such as time of the year are automatically taken into account by this intelligent light concept and integrated into the programming. The intelligent control concept with its e:cue Sympholight light management system features intuitive and user-friendly system operation. Light curves are programmed in for each day of the year according to the time of day and year. Around 350 brightness- and presence sensors also detect the current ingress of daylight and presence of employees, enabling the preprogrammed light curve to be modified if required. 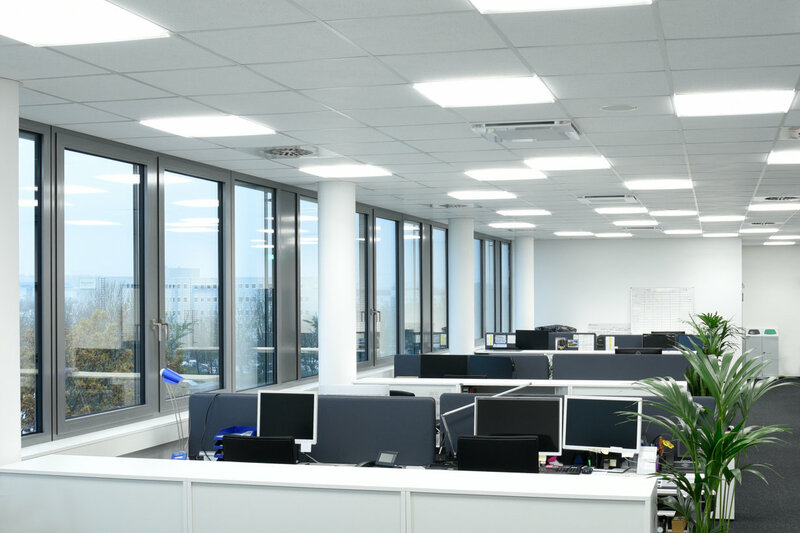 As a consequence, the lighting level is increased for example on an especially cloudy day or else switched to energy-saving mode if the office is not occupied. The system's swarm function is especially efficient: if any workstations are still occupied in the evening, the luminaires above these can be operated at normal level (up to 100 percent) whilst other luminaires in the vicinity are dimmed to an energy-saving and therefore cost-saving 10 percent lumen output. Further benefits of the control system include it utilising the IT infrastructure of the building without the need for the supplementary routing of cables, and also that employees can be simply assigned access rights, enabling them to independently control the light at their workstations using e.g. a PC or tablet. Thanks to the cloud- based Symphograph data management system the light-specific energy consumption of the complete building can not only be systematically controlled (i.e. energy monitoring) but also significantly reduced in total. Any luminaire failures or faults are automatically reported to facility management – this also saves costs and time. Symphograph also enables building users to integrate other intelligent devices and systems via the open interface as well as develop additional functions and algorithms themselves – also beyond standard lighting functions. The software features a simple graphic interface allowing the design of new functions such as a perimeter safety zone in which alarms can be triggered via sensors, actuators and switches. If the functional office lighting is not in operation in evening hours and at night the building gains a completely new appearance. Traxon Monochrome Tube LED luminaires are used to contour the central building section with white lines – a simple but highly spectacular three-dimensional architectural effect. Linear Allegro RGB LED luminaires are also ceiling-installed in the open-office areas and Skygarden, with indirect light in the orange Osram CI colour. The most characteristic and noticeable element of the facade display is the framing of the entrance with a gigantic LED screen that is also centrally controlled via e:cue Sympholight. Comprising many 64pxl Board LED components from Traxon, this LED media screen has countless possibilities for visual content – ranging from innovative corporate presentations to abstract lighting effects and event-related information transmissions. The highly effective LED facade lighting and media screen impressively display and highlight the building from the outside. Dimming values and colour values are set for each luminaire or luminaire group under consideration of time and daytime brightness. The sensor technology registers the actual light ingress and can call up a light scene deviating from the standard on e.g. a very cloudy summer day. 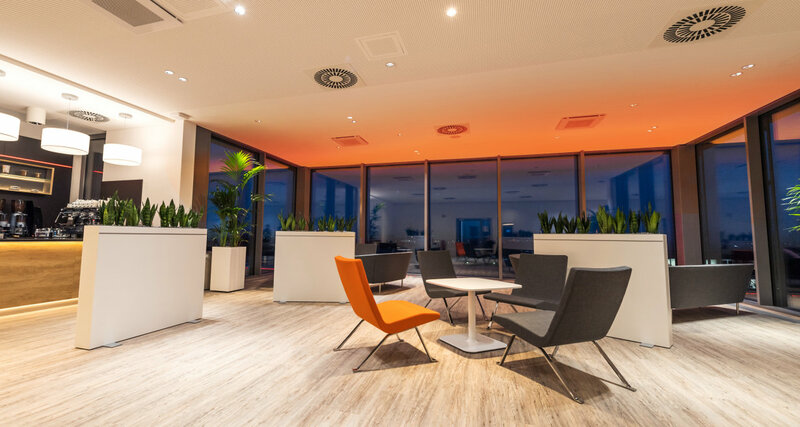 A relaxed atmosphere in the Skygarden is created by Lunis downlights and wallwashers with a warm light colour, light coves with flexible LED strips along the walls and Traxon Allegro RGB LED linear luminaires that illuminate the ceiling and the view from below with orange. Mira recessed luminaires from Siteco are used in the offices, controllable in light colour and light intensity via Tunable White functionality.